Fellow Columbus Crew SC fans: Welcome to the next edition of our Monday Recap. Today, we have more updates from the Save The Crew team, a general Columbus update, the game recap, and a bit of news from Austin, Texas. On Thursday Save The Crew released an open letter to the ‘future’ owner of the club. On Friday that letter appeared as a full-page ad in Columbus Business First. 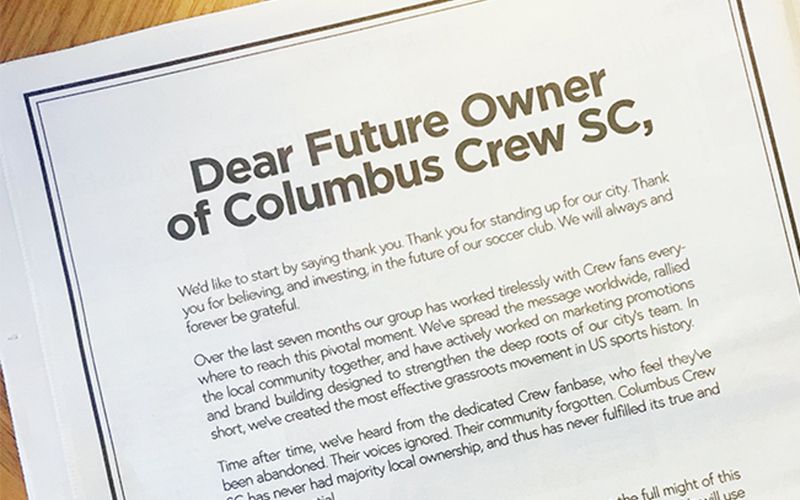 The letter reiterates everything that Crew supporters already know. Given the right ownership, Columbus is the perfect city for a robust MLS club. Businesses are ready and the fans are ready. Almost immediately pledges were made for more than 5,000 season tickets. And that number has continued to steadily rise. This shows the future owner the long-term viability of Columbus Crew SC. Launched on Friday, Save The Crew has a brand new advertising campaign running on digital boards just outside of the Columbus International Airport. The boards are on the side of the Fairfield in and can be seen by every person who exits the airport, as well as those in the Delta terminal. The digital boards carry the message “Welcome to the original soccer city USA” and closes with a call to visit the Project 2019 Pledge page. Keep an eye out around town as more ads will be popping up soon! FC Cincinnati looks set to become an MLS club in 2019. There were swirling rumors that the announcement could come much later, pending the conclusion of the current Columbus Crew situation. However, it appears that MLS was waiting for was a new stadium deal to be approved. FC Cincinnati would allow for an all-Ohio rivalry to be created within the MLS. Save The Crew believes strongly that the addition of FCC to MLS at this juncture only strengthens our cause. Launched just in time for Rock on the Range, and available all season long, you can now use the Save The Crew snapchat filter at MAPFRE Stadium and the surrounding parking lots. Simply bring up snapchat, and swipe until you find the filter. Happy Snapping STC’ers! A game that featured two of the top 3 teams ended in a tie. Gyasi Zardes failed to convert a PK and further extend his golden boot chances. Pipa was sent off late into the first half on a dubious red card foul (was not called a foul during play). However, our karma was returned as Christian Martinez (somehow) was not sent off after a slap on a Sporting KC player. The Crew play again, at home on 6/2 against Toronto, lets see if we can bring back home the Trillium Cup! As we have known this entire time; not only is McKalla place up for an MLS stadium site, but the area is also being considered for affordable housing. The city of Austin is becoming overcrowded, and there are not meant viable options in terms of affordable housing. The warehouse district of McKalla place seems perfect for the venture. The stadium plan by PSV/MLS is due to the Austin City council by 6/1/18. We will see which option is more beneficial in the eyes of the Austin City Council (3). (1) Jeffrey, Adams. Columbus Crew: Two US cities fight over one football team, 5/27/18. (2) Arney, James. Anthony Precourt seems to believe MAPFRE stadium maintenance is a sunk cost for PSV.